You are at:HomeUncategorizedNational Night Out! You Going? National Night Out! You Going? Pssst…want to share an appetizer? We could maybe get the Queso Chipotle Dip (I have this THING for queso), Garlic Shrimp (get your gum) or how about the BLACKFINN CRAB TOWER?? Okay, if we are going to do this thing, then you are going to need to meet me, Rachael of RachRiot and Patti of Insane In The Mom Brain on Wednesday, October 16th, at BlackFinn American Grille at 1910 Bagby in Houston, Texas, ya heeeeeeeeeeeeeeaaaaaaaaaaard meh? Why are we all getting together and wanting you to come and share an appetizer with us? Well, the idea wasn’t mine but I’m liking it. The idea was Jen’s of People I Want To Punch In The Throat. (I met her once. No throat punching happened.) The popular book I JUST WANT TO PEE ALONE (http://tiny.cc/v90l3w) where 30 of us got together and tossed some funny mom stories into a best-selling book was her brain-child. It seemed logical to her and also seemed logical to me (and I’m betting logical to you, as well as logical to that lady who oversees the self-checkout registers at that store around the corner) that people who like to pee alone also like to get out alone for a Girl’s Night. Am I right or am I right? I know you all don’t live in Houston, so this is where this gets really fun. 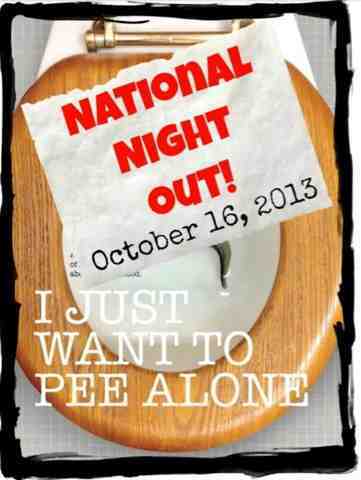 People are meeting all over the United States on the 16th, y’all! People that live in states far away from here! This is insanity! Whew!! That’s a lot of places! And here’s the deal…if you don’t see your city, you can organize a night out and get it listed on the Pee Alone Facebook page. Fun! Go here (http://tiny.cc/ohyl3w) to RSVP so we can, or someone else can in another city, see your lovely face. I’d love to hear if you are even just thinking about it in the comments. Disclaimer #1: If you prefer to pee in front of an audience, you are still welcome to attend. Disclaimer #2: You don’t have to be a mom to attend. The more variety, the better, I say.